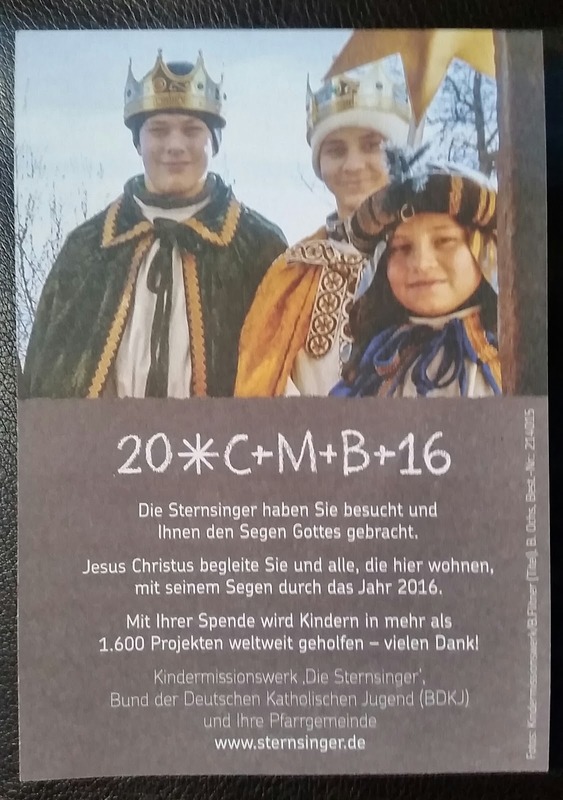 What Does 20 C*M*B 16 Mean on the Door in Germany? I've lived in Germany for over a year now and as of today, finally grasp what this day (these days) are about. In fact, just a few hours ago 3 younger girls showed up at our house dressed up with crowns and robes. What is this all about? 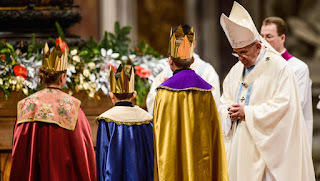 Epiphany, a predominantly Catholic holiday, is the 12th day after Christmas and celebrates the visit of the wise men to the Savior, and "the manifestation of Christ to the Gentiles as represented by the Magi (Matthew 2:1–12)" according to Google. It is also known as Three King's Day in many countries. Celebrations and customs vary according to where one lives. 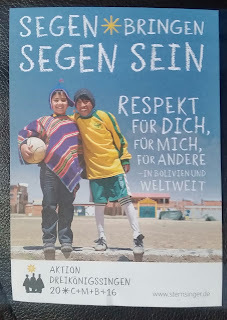 Here in Bavaria, as mentioned previously, kids, called Die Sternsinger (star singers) go around to houses dressed up to sing and solicit donations for different causes such as fair trade, healthy eating for kids in impoverished countries, children's rights, and support for refugee children. Last year, they raised 58 million euro, the largest ever. In return for a donation (and according to some research I did, they are given treats at some houses) they bless the house by marking the year over the door with chalk. 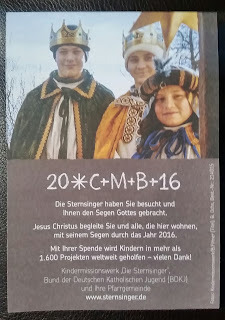 In our case, we were given a sticker with the 20 C*M*B 16.According to one site CMB stands for the traditional names of the 3 wise men and/or it stands for Christus Mansionem Benedicat, the Latin words meaning, May Christ bless this home. David said the kids didn't sing for them, but they did recite a little poem. They also gave us a little flyer. I went to the official website for Die Sternsinger, and read (using Google Translate) this article about refugee children joining the star singers this year. The theme it seems, for this year is "Respect for me, Respect for you, Respect for everyone." What a better way to show that than to allow these mostly-Muslim children participate. 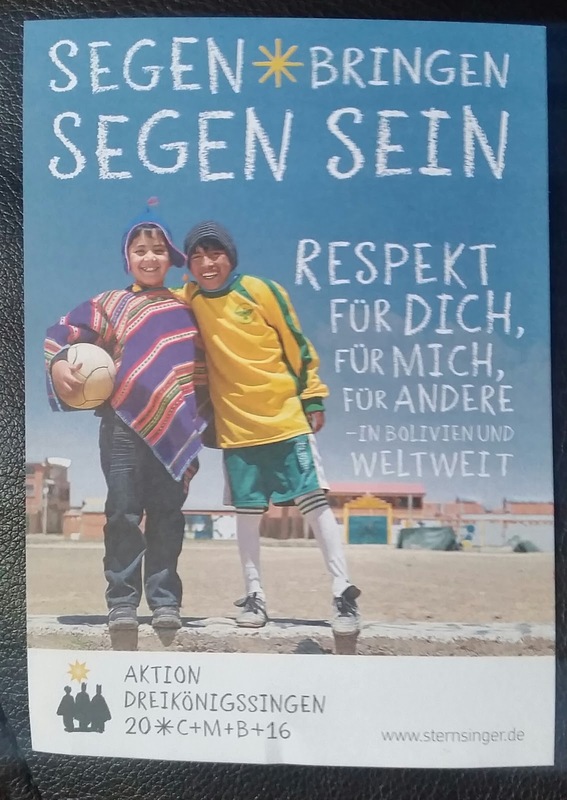 According to the article, 1 million refugees have registered in Germany many of which are children who are excited to learn the customs and traditions of the country. I love living in a place where I am given an opportunity myself to not only learn about these traditions but to participate in them too. That is super neat. That is really cool to be able to learn about different traditions! Next year we are going to be studing world geography, I am hoping to incorporate some world traditions, especially around christmas, into our school year.